Finding Opportunities in Fixed Income? We think the U.S. Federal Reserve (Fed) is running out of room to move. The markets’ response to their recent interest rate hikes leads us to believe that Fed policy is near neutral, meaning neither loose nor tight. In recent months, market-based inflation expectations have fallen, while the yield curve has flattened (exhibit 1). These measures suggest that inflation is not a near-term risk, despite improvements in the labor market. Still, the Fed plans to begin paring down their balance sheet soon and may continue to increase short-term interest rates later this year. If the Fed is not careful, this double whammy could tilt the U.S. economy into a recession. 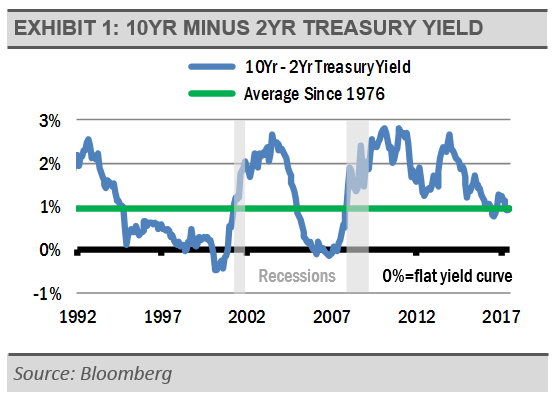 History suggests that when the Fed over-tightens, the yield curve (10-year Treasury yields minus 2-year Treasury yields) can invert, or be negative, and a recession can follow. Our base-case scenario is that the Fed will proceed with their balance sheet reduction, but slowly move rates higher. 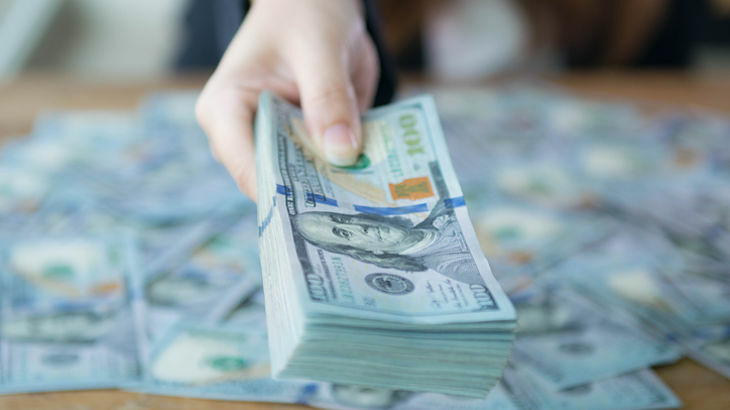 This should keep them from moving too far, too fast, and hold the yield curve sufficiently steep, while allowing the business cycle and the equity markets to continue to march ahead. Meanwhile, U.S. economic fundamentals remain strong. We have seen a surge in leading economic indicators, while small businesses appear optimistic and U.S. job openings hit an all-time high in June. Additionally, S&P 500 Index earnings for second quarter of 2017 are expected to have increased more than 10% over the second quarter of 2016. 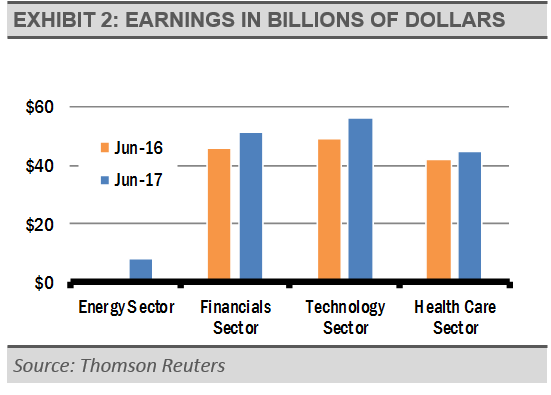 This growth is partly due to the earnings recovery in the energy sector, but we are also seeing strong earnings growth in financials, health care, and information technology. Even with these positive fundamentals, tight corporate bond spreads and low equity market volatility suggest that the financial markets are too complacent. 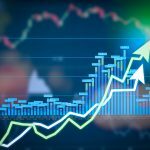 There are risks lurking that could cause a spike in fear and volatility, and possibly result in a short-lived market correction. Historically, the equity market goes through a correction every 18 months with prices declining at least 10%, though the market typically recovers very quickly (exhibit 3). 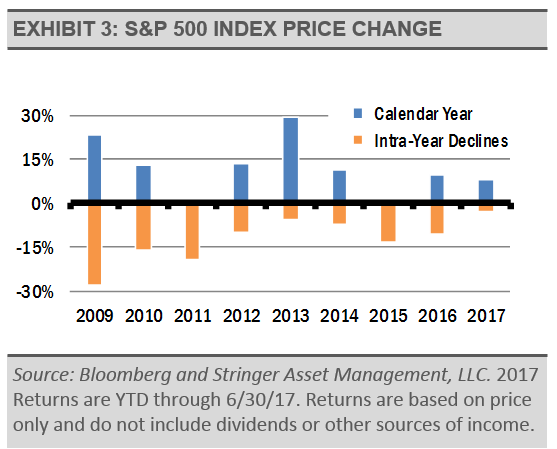 In fact, the S&P 500 Index usually finishes the year with a positive return, though there can be significant declines during any given year. The last correction bottomed in February 2016, or about 18 months ago.